Whether it's finding your best content for an end-of-year wrap up, identifying your competitors biggest posts of the last quarter, or reporting on branded content campaigns, CrowdTangle's historical data feature can help. Our system maintains full histories of all Facebook pages, Instagram accounts and subreddits in our database; and stores the last 3,200 tweets for each Twitter account we track. Open the CrowdTangle dashboard of your choosing and click on the gear icon in the top right corner next to your photo; select Historical Data. 2. Set your parameters, such as what lists should the system pull from; what keywords (if any) should it search for and what type of posts should it return. Don't forget to specify what metric you'd like it to use to order your posts. 3. Set your date range. You can use any of our pre-set date ranges, or select Custom. 4. 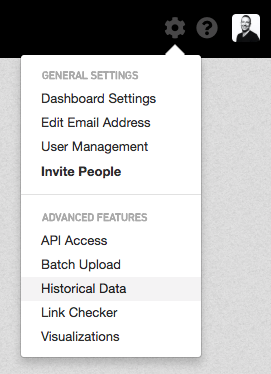 Select “Fetch History.” You should receive an email with a CSV ready for you to download all the data you requested. 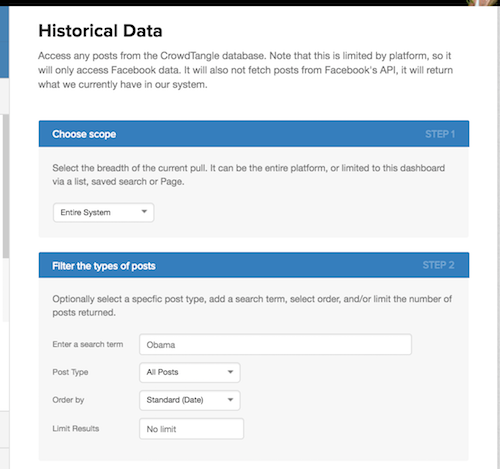 You can export the history of any account going back to the very first post they made on Facebook, Instagram and Reddit. *Twitter allows the last 3,200 tweets. What are some ways local news rooms might use historical data? Pull your entire last year's history for your market's main account and do a “best of” year end post using the highest performing posts. Fetch top posts from your talent for the last 3-6 months and look for opportunities to do follow up stories on the ones that performed the best. Search a specific keyword in a list of local influencers or politicians and see a public record of their comments on a specific topic or issue. Identify trends, new strategies or top posts that drove high engagement for a competitor. It's been awhile and I still haven't received my CSV. What's up with that? First, double-check your spam folder and make sure it didn't end up there. If you still don't have it, and it's been awhile, shoot us an email at support@crowdtangle.com and we'll look into it for you. Note: the longer the selected time period and larger the list, the longer it will take for the system to return your request.